You will see the stadium complex on the corner of Maple Avenue and College Road. Please click here for more location information and directions. Spectators: Please park in Lot 1, 2 or 4 (parking garage). 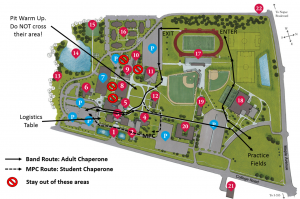 Overflow parking may be available at Benet Academy (across Maple/Chicago Ave). 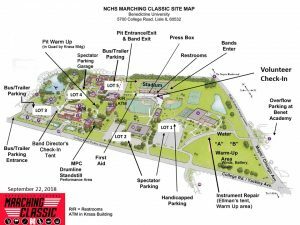 Bands: Please follow the directions given to you for your buses and equipment trucks and trailers via email from the NCHS Band Directors and Staff or on-site.